Morning should not start with coffee! True, if you cannot refuse a cup of strong waking drink, do not forget that strong drinks require snacks. Proper breakfast is a guarantee of not only a good start to the day, but also health for many years. For example, sandwiches with rye bread will be saturated with microelements and will not allow you to get hungry ahead of time. Scientists believe that skipping breakfast is the main cause of obesity. 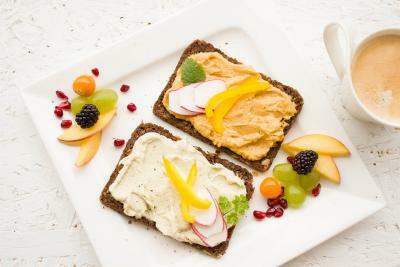 For people who systematically skip breakfast, the metabolism is slower than the average by 5 percent, and for those who have breakfast every morning, the metabolism is 4 percent faster than the average. The perfect breakfast should combine complex carbohydrates, sugars, protein and a small amount of fat, its necessary for proper absorption of vitamins and minerals. Carbohydrates are primarily cereals: porridge, muesli, granola. A source of sugars and an excellent addition to porridge will be fruits, dried fruits, honey or jam. Dairy products containing protein and lipids will complete the morning quartet. Cereals, fruits, berries and milk are a great beginning for the day. If you are too lazy to cook porridge in the morning - pour muesli with milk. Fatty and meat breakfasts will not allow your body to wake up, but load the stomach and spoil the mood - and perhaps digestion, too - for the whole day. The absence of any breakfast can cause more serious problems: people who do not have breakfast have a much higher risk of developing thrombosis in the morning. Most of strokes and heart attacks occur in the morning. and if you miss not only breakfast, but also lunch, you may fall into a hungry faint. Many people think that breakfast is something unimportant and just skip the morning meal for fear of getting fat. But it is better to eat once again in the morning than to overeat at night, before going to bed. Add a plate of oatmeal, scrambled eggs, yogurt, fruit, cheese and chicken sandwich to your usual coffee with a bun. If you are preparing for workout - focus on the protein component, if you are going to think more than move - on carbohydrate. Berry or fruit smoothies invigorate no worse than coffee - especially when it is already warm outside and there is no need to drink something hot. A full breakfast, especially consisting of a variety of cereals, helps to reduce blood cholesterol levels significantly – and the risk of cardiovascular diseases as well. Morning meal saves from gallstones. Any fasting - including refusal of breakfast - increases the risk of gallbladder disease. Have breakfast every morning and stay healthy! 1000 Ecofarms / Online magazine / Learn and Explore / How important is breakfast?